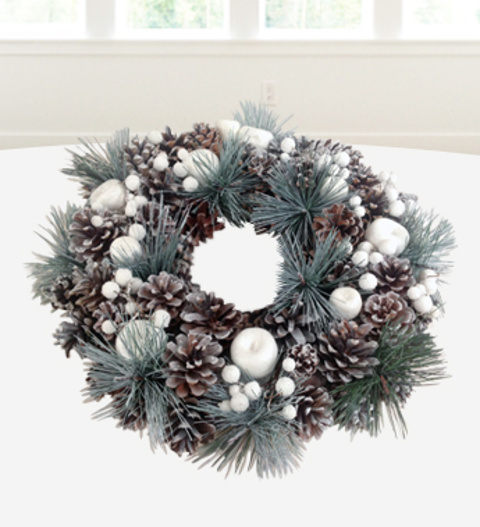 Our luxury Christmas wreath is exclusive to Prestige Flowers with festive pine cones and winter berries. Bring the spirit of Christmas to life with the festive scent and colours of Christmas bringing together a very classic but luxury Christmas wreath. The Luxury Noel is a perfect accompaniment to add to your home decorations and is a beautiful gift to send to family, friends, colleagues and employees this Christmas. Included is a FREE box of Belgian chocolates! The Luxury Noel Wreath is available for UK next day delivery. Chocolates may contain nuts.